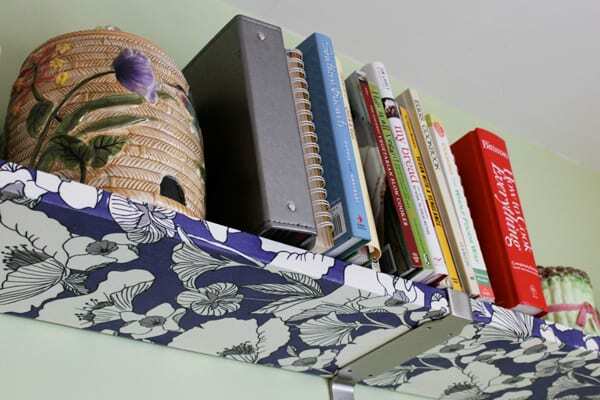 Give those boring shelves a complete makeover – decoupage fabric with Mod Podge Hard Coat – this is an easy and budget friendly project! Hi! This is Heidi from Hands Occupied with tips on how to decoupage fabric onto shelves. 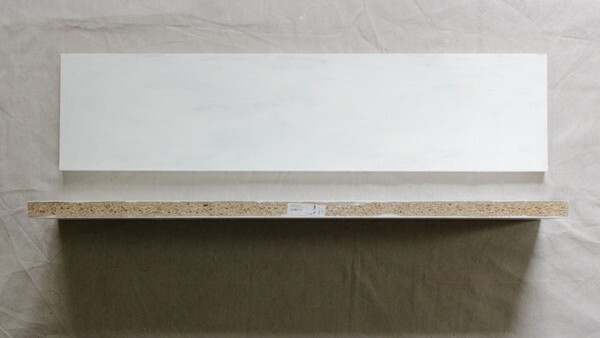 It's easier than you might think – especially when you're working with something like a simple shelf. I had some shelves to make over because I moved to a new apartment, and the black shelves went well with my old living room decor, not so much with my new kitchen decor that's all white, natural-finish wood and light green. Start by sanding and priming your shelves (if necessary). 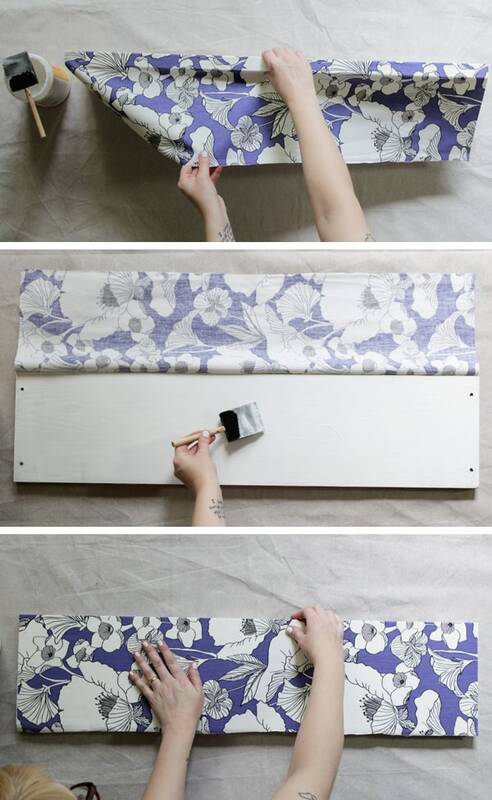 The color of the shelf will show through the fabric you decoupage onto it, which is how you'll know if priming is needed. My shelves are those ekby bjarnums from Ikea, in the dark finish, with brackets covering the left and right-facing ends, so I only needed to prime the front edge, top and bottom of the shelves. My fabric is white, which is why I used white primer on my shelves by the way. 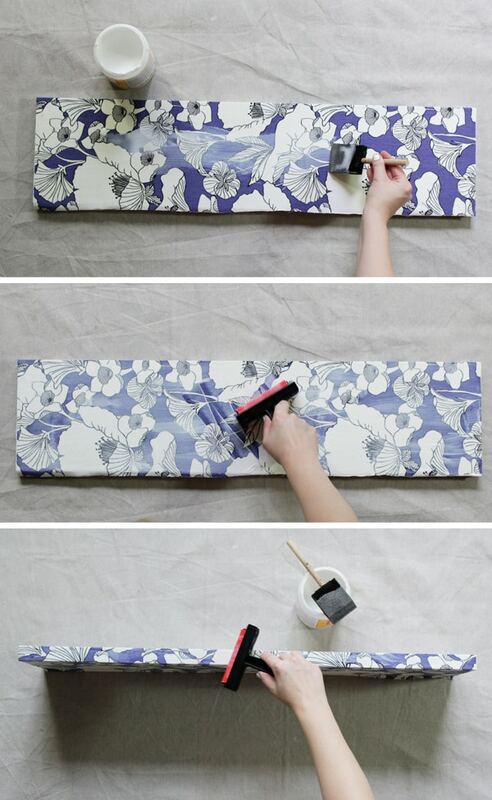 Cut a piece of fabric large enough to cover your shelf plus half an inch on the ends. Again, since my shelf only required coverage on the top, bottom and front edge, I only needed a rectangle large enough to wrap around my shelf like a Christmas present, but with open ends on the short sides of the shelf and a little bit extra on the long side to wrap the fabric over to the edge that will be facing the wall the shelf is mounted on. Next, apply a layer of Mod Podge Matte onto one side of your shelf and carefully align the fabric so it lays square on the shelf, leaving about an extra half inch of fabric hanging off the first end. Right now is the time to get your fabric perfectly straight – you won't be able to adjust it after this step. When you're all lined up, smooth down the fabric onto the shelf and Mod Podge. 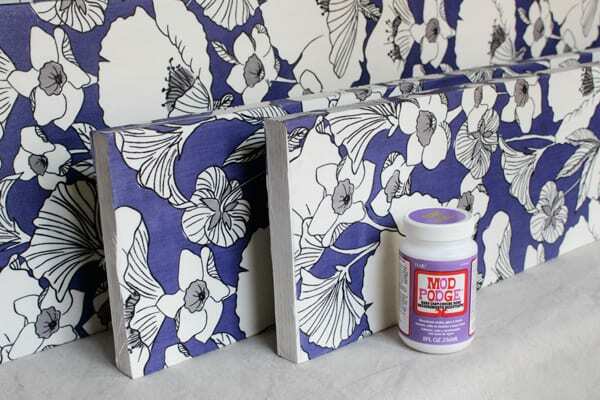 Apply Mod Podge to the front edge of the shelf and carefully fold the fabric over it, smoothing it into place snugly. Feel free to pull on your fabric as needed, but don't pull on it so hard as to stretch your fabric weirdly, warping the pattern. Next, paint Mod Podge onto the third side of the shelf and smooth the fabric into place once again. There should be about a half inch of extra fabric on both raw ends of your fabric. 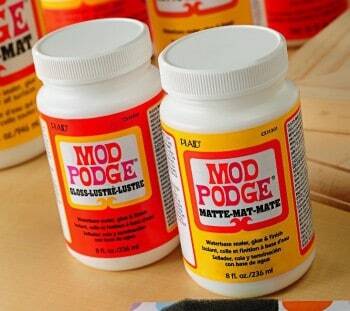 Paint a last layer of Mod Podge onto the wall-side edge of your shelf and stick the raw ends onto it. The next phase is to – one side at a time – paint Mod Podge all over the outside of your fabric and use a brayer to force the Mod Podge all the way through the fabric. Do all four sides and let the whole shelf dry completely. 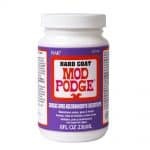 After your shelves are dry, paint over all four sides again with a layer of Mod Podge Hard Coat, and let your shelves dry completely once again. Before hanging them up, let them sit and cure for four days. 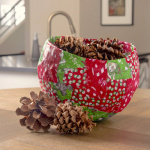 Like this decoupage fabric project? Check out Hands Occupied on Facebook, Twitter and Pinterest. Love the idea of using fabric to cover the shelves, it really opens up a whole world of prints and textures. This is such a pretty and inexpensive way to add color to a bookcase or shelf. 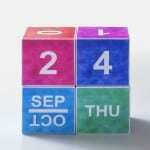 I love this idea – Great job! How about using fabric to cover the brackets too? The shelf would appear to float! What a great idea! love it! 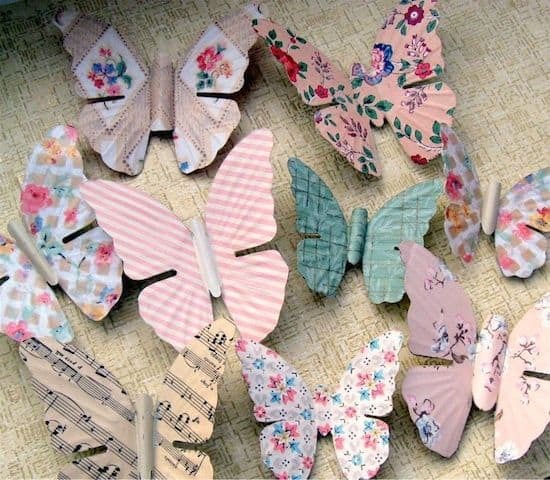 I have just started doing a couple of decoupage projects but haven’t been that brave yet! 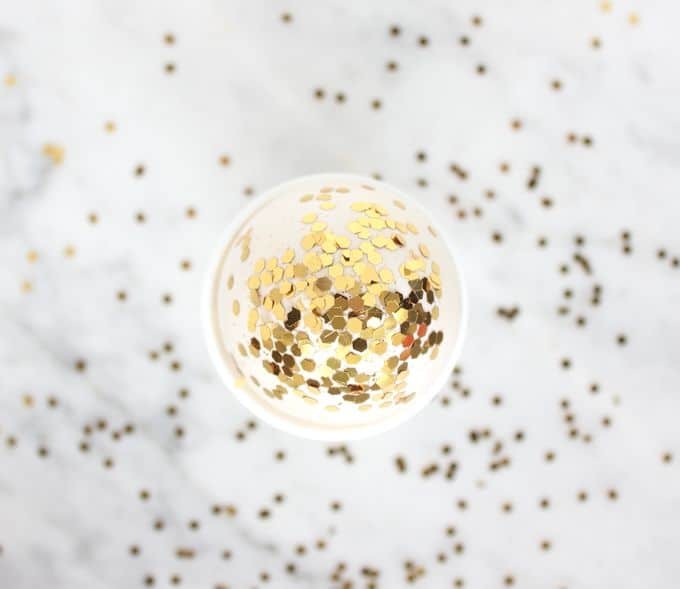 This could well be the next thing I try – will let you know how it goes!